James Washington Henshaw1,2,6,7 [Washington Henshaw8]. Henshaw, Jas W., age 30, born in Tennessee; farmer; $1000 real estate; $150 personal property. Henshaw, Martha, age 26, born in Indiana; "K H" (keeping house). Henshaw, F. [unclear] E., male, age 2, born in Tennessee. Henshaw, Levi, age 56, born in Tennessee. Henshaw, Margaret, age 53, born in Tennessee. Henshaw, Wm, age 25, born in Tennessee; farmer. Henshaw, James, age 39, born in Tennessee; parents born in Tennessee; miller. Henshaw, Mattie, wife, age 35, born in Indiana; parents born in Tennessee; keeping house. Henshaw, Frank, son, age 12, born in Tennessee; father born in Tennessee; mother born in Indiana; attended school. Henshaw, James, son, age 8, born in Texas; father born in Tennessee; mother born in Indiana; attended school. Henshaw, J.W., age 59, born June 1840 in Tennessee; parents born in Tennessee; married 9 years; occupation: grocer; owned home (free). Henshaw, Angie, wife, age 45, born June 1854 in Texas; parents born in Mississippi; married 9 years; 3 children, 3 living. Henshaw, Frank, son, age 32, born Mch 1868 in Tennessee; parents born in Tennessee; single; occupation: salesman. Roberts, Cora, daughter, age 22, born Dec 1877 in Texas; parents born in Texas; single. Roberts, Geo, son, age 19, born Dec 1880 in Texas; parents born in Texas; single; occupation: day laborer. Sullivan, Jno L., son-in-law, age 32, born Aug 1867 in Kentucky; parents born in Kentucky; married 6 years; occupation: US [..unclear..] mail clerk. 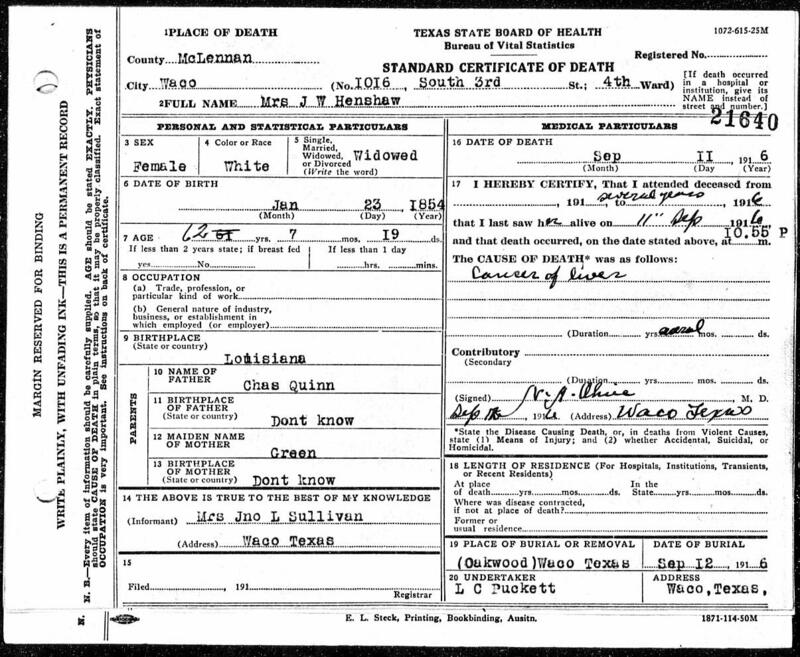 Sullivan, Nora, daughter, age 25, born Feb 1875 in Texas; parents born in Texas; married 6 years; 1 child, 1 living. Sullivan, Sallie, granddaughter, age 4, born Oct 1895 in Texas; father born in Kentucky; mother born in Texas. Henshaw, Angey [unclear], head-of-household, age 56, born in Texas; parents born in Texas; widow; 5 children, 4 living; occupation: none. 1870 census, Paris P.O., Beat 1, Lamar County, Texas; roll M593-1594, page 213, line #12, dwelling #411, family #468. 1880 census, 3rd Ward, Paris, Lamar County, Texas; roll T9-1314, ED 82, page 223C, line #21, dwelling #141, family #144. Contribution from Tom Newman (), citing: Levi Henshaw family bible. 1900 census, 4th Ward, Waco, McLennan County, Texas; roll T623-1656, ED 78, page 20B, line #93, dwelling #357, family #362. Posting Dec 23 2004 by Tom Newman () to HINSHAW-L, citing: Levi Henshaw family bible. 1850 census, Greene County, Tennessee; roll 880, page 218, dwelling #988. 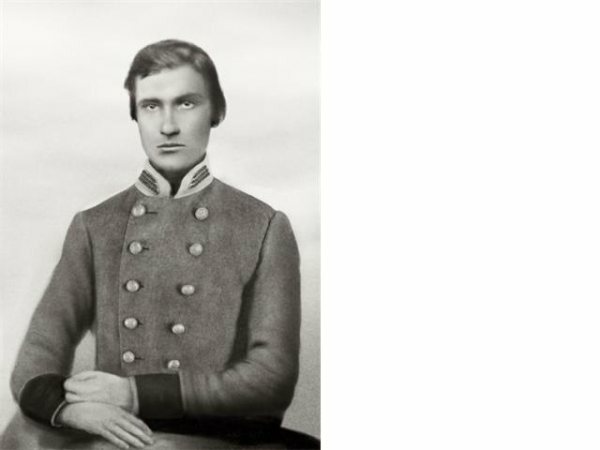 Tennessee Civil War Regimental Histories; http://www.ancestry.com. 1850 census, Division 9, Greene County, Tennessee; roll M432-880, page 189, line #36, dwelling #759, family #759. 1860 census, District 24, Greene County, Tennessee; roll M653-1252, page 415, line #24, dwelling #689, family #689. RootsWeb WorldConnect data by Betty Butts (). RootsWeb WorldConnect data by Sam Maner (). RootsWeb WorldConnect data by Robert W. McGahuey (). 1910 census, 4th Ward, Waco, McLennan County, Texas; roll T624-1575, ED 88, page 205B, line #56, dwelling #63, family #78. Photo courtesy of Tom Newman ().